Commonly referred to as push piers, jacked piles, resistance piers, or hydraulically driven piers, these systems developed from a growing need to address building settlement problems. These systems have patent history dating back to the late 1800's and had their early beginnings in the populated areas of the Northeast. Several inventors from New York were the pioneers of these systems, and had a common methodology of pushing "hollow tubular column sections" to load bearing strata by reacting against an existing building or other structure. The ingenuity of these early inventors paved the way for the development of numerous push pile systems in an industry which has grown dramatically since the 1970's. Push piers have earned acceptance in the engineering community, and the industry continues to expand into systems capable of ever-increasing load capacities to serve the needs of the structural underpinning industry. Push Pier Systems utilize high-strength round steel tube sections and a load transfer bracket to stabilize and/or lift sinking or settling foundations. The foundation bracket is secured against the existing footing and pier sections are driven hydraulically through the foundation bracket and into the soil below using the combined structural weight and any contributory soil load as resistance. 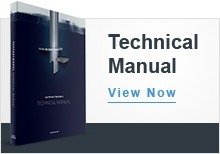 Pier sections are continuously driven until a suitable load bearing stratum is encountered. At that point, the structure either begins to lift or the target pressure/load is achieved. The weight of the structure is then transferred from the unstable soil, to the foundation brackets, through the piers, and to firm load bearing soil or bedrock. Push Pier systems develop a factor of safety against pier settlement by the pier installation methods used and the sequence with which multiple piers are driven and then re-loaded. Piers are first driven individually using the maximum weight of the structure and any contributory soil load. After all of the piers are driven, the piers are re-loaded simultaneously, and the total reaction load is distributed over the multiple pier locations. The average load on each pier during the load transfer operation is generally less than 75 percent of the load during pier installation/driving, for a factor of safety of at least 1.3. Typical factors of safety against pier settlement range from about 1.5 to 3.0, with higher values generally achieved for structures with greater rigidity. 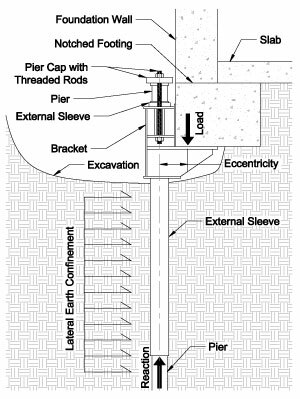 These factors of safety conservatively ignore any additional long-term frictional component to the pier’s capacity.